There is no reason to reveal the ingredients of this easy, breezy pie to anyone unless they ask for the recipe. Definitely DO NOT tell anyone it is healthy unless they are into healthy. My dad critiques all my recipes and this is one of his favorites. Daddy is a good ole country boy that loves meat and anything that grows in the garden. He is very leary of trying anything “out of the box”. I never tell him what he ate until he says it’s “larapin”. Even then, I may not come clean. He’s been known to ban a food even if he liked it, if he perceives it to be “too wierd”. This one I’ve keep close to the vest. Go ahead. You can’t miss with this one! Add all ingredients to a processor except the whipped cream and process until very creamy and smooth. Add in whipped cream and pulse until just blended. Pour filling into a ready standard gluten free pie crust or use recipe below. Top pie with whipped cream and chill at least 1 hour before serving. Add more deliciousness by arranging berries on top or finish with dark shaved chocolate. Use your imagination! This pie will impress the most discerning chocoholic. DO NOT tell until the raving is over! Note: If using coconut oil, remove the pie from refrigerator10 minutes before serving. Coconut oil solidifies when it is cold and will make the pie hard to cut. *The avocado needs to be perfectly ripe. Too ripe and your pie will taste like avocado and not ripe enough, it will not cream well. Purchase your avocado ahead of time to be sure you are ready to go. The avocado should yield slightly to firm pressure. Too ripen an avocado quickly, place it in a paper bag with a banana. Add rice crispy puffs and nuts to a large processor and process into a meal. Swirl in butter, choice of sweetener, dash of salt and pulse a few times to incorporate. Turn the processor to on and process until mixture just starts to hold together loosely (DO NOT OVER PROCESS). Add a little water if needed a teaspoon at a time. To test, squeeze a little dough in your hand. If it sticks together, it’s perfect. Turn out dough into 9” pie plate and press crust firmly into place, bringing it carefully up the sides of plate. Smooth and even out the top edge. Place crust in freezer while preparing filling. Add all ingredients to large cold stainless bowl or processor and whip on high speed until smooth and creamy. Allow to chill for a few minutes before serving. 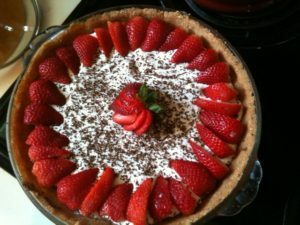 This entry was posted in Delectable Desserts, Food IS Talking Recipes and tagged dairy-free desserts, Diabeticfriendlydesserts, gluten free chocolate pie, vegandesserts on April 25, 2017 by intuitivechef.